Looks like there might be some confusion about the broadcast times for these. Check your local listings to see when Haunted Mansion, Phantom of the Megaplex and Scream Team air on Toon Disney, because the CarsToons air right after those, respectively. Also, here's an article with some images and a clip from the 'Toons. Want to see what I've been up to for the past 9 months? It means you'll have to watch the Toon Disney channel (but you do that anyway, right?). Our series of "CarsToons", Directed by John Lasseter, Co-Directed by Robb Gibbs and myself, will be premiering over three nights, then will be in heavy rotation on the various Disney Channels as well as ABC Family. Even if you're not a fan of the Pixar film "Cars" I think you'll enjoy these. They're very short and very silly, and they all feature Mater the tow truck reminiscing about the wild adventures he supposedly had. These are played strictly for laughs, and they owe a lot to Chuck Jones and his wonderful Warner Brothers shorts. For me (and my team as well, I hope!) these were a lot of fun to work on, and a huge learning experience. Rob & I got to work under the close tutelage of John Lasseter, and we were also free to add in our own ideas and really run the production from start to finish. I really enjoyed stretching out and working with all the other departments that I normally don't interact with as an animator. I found that my years of experience working on pre-rendered adventure games back in the 90's really came in handy, allowing me to communicate with the modelers, shaders, lighters, etc. Thanks, Presto Studios! I am also fully aware of how lucky I am to have been chosen by John Lasseter for this role, and what's more, to have had a chance to work with him on a weekly basis. I think our production has gotten more "John Time" than any other this year. He's been extremely supportive and helpful to us in getting these made and making them the best they can be. The schedules were intense (we cranked out three complete short films in less than a year) but we were lucky to have extremely talented people working in all departments to help us realize these shorts with feature-quality production values. I only had time to animate a few small shots myself, as I was spending most of the time in editorial and various reviews and meetings. Edit: I forgot to mention that we screened all three at Pixar about a week ago and they looked fantastic on the big screen. The company seemed to really enjoy them, too. It's a shame that everyone else wont be seeing them in a theater. I only hope these shorts get broadcast in HD at some point, and that everyone gets really big HDTV's and 5.1 sound systems for Christmas! They look and sound that good. *TOON DISNEY* (all times ET/PT, meaning they air at the same time on both coasts). "Rescue Squad Mater" -- Mater is a fire truck that rescues Lightning McQueen from a burning building. When McQueen is rushed to the hospital, he discovers that Mater is a doctor, too. 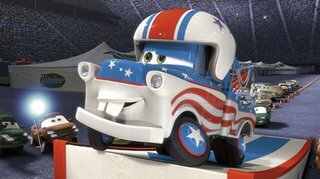 "Mater the Greater" -- Mater is a famous daredevil who does all kinds of stunts. Lightning McQueen becomes an unwilling participant in Mater's greatest stunt ever. "El Materdor" -- Mater is a famous bulldozer fighter in Spain. He's so good, he's able to fend off multiple bulldozers at once. Lightning McQueen joins Mater in this Tall Tale just as things are at their worst. All three Toons begin airing on the Disney Channel on November 1st. Each Toon will run daily, totaling more than 20 times per week. Premieres on December 23rd in conjunction with "Polar Express". I saw this short on Hyun-min Lee's CalArts student reel a few years ago when she was applying for an internship at Pixar. It's really beautifully done, and has a nice feminine style too it. You can read more about her and the film here.